8x Produce of Dam & 5x Champion! Patagonia's Juneau is a 5x Champion and 8x Produce of Dam Winner! Juneau comes from a long line of champions. 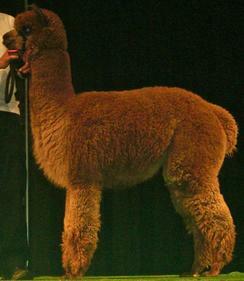 Her sire is Patagonia's Lennox, and paternal grandsire is Danko. Her dam, Preciosa of Lonepine Ranch, is a Yupanqui daughter. Preciosa received 1st Place Produce-of-Dam at Alpacapalooza 2007, and 3rd Place Produce-of-Dam AWE 2007. AOBA 2010 Fawn Color Champion! This gal's a "game changer". Undefeated in 2010!!! Aurora is Juneau's first cria. Juneau is a multiple award winner, and Aurora has followed in her mother's footsteps as a real show stopper! 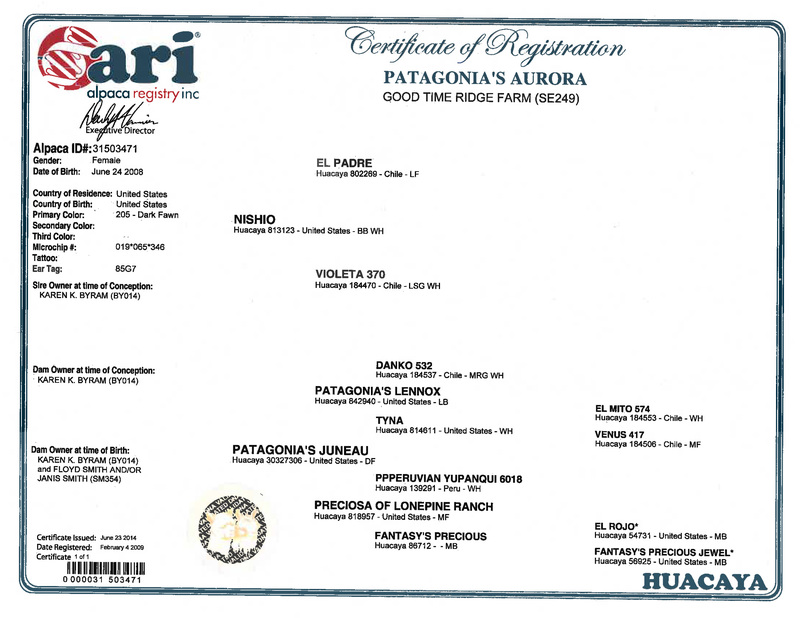 Her sire is the award winning Patagonia's Nishio. Judge Jude Anderson at GWAS 2010: "This is no surprise. Everyone needs to get their hands on this alpaca to feel the fineness and density! Hands down the Color Champion in the most difficult class of the day."